punta cana is supposedly where it's at! i know 4 different groups of people that have gone there in the past year and they all got a great rate. I emailed one to find out where she got her deal, I'll let you know! Thanks Allie! We were definitely looking at Punta Cana. I'd love to hear about her deal? Do "all-inclusives" include food? I always assumed they did and that it wouldn't be ideal for people like us. I've considered cruises, but had that same food issue. Anyone have any experience with either? The all-inclusives do include food and this is definitely something that's been in the front of my mind about this trip. I'd be curious to hear from others about it. I've heard cruiselines are great about gf meals but not so sure about foreign hotels. 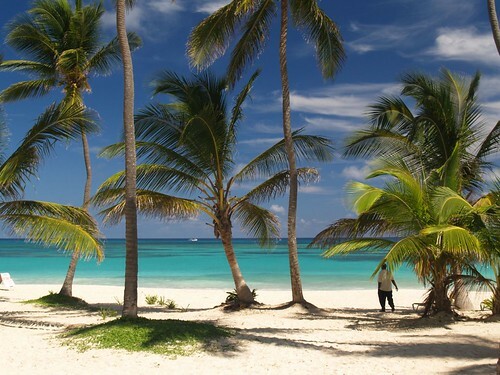 Exactly three weeks from right now my feet will be in the sand on a beach in Punta Cana. We went to Cancun for our honeymoon and the resort we stayed at had three main food options: buffet, room service, and fancy restaurants. I wasn't off gluten at the time so I'm not sure how that would have gone, but at least with a buffet you can pick and choose your own food, though the downside of that is that it's pre-prepared. In general these places will bend over backwards for you though and I'd think that as long as they know what to do -- and they should, given the number of people that go through these things -- you should be fine. But it's definitely something to check on. One tip: on the first day, when you feel like you've got all the time in the world there, they sit you down and try to sell you excursions. This gets you out of the hotel so they don't have to feed you for the day. They can be fun, but the time goes by faster than you think, so remember to budget time to just lay around; it's the best thing to do at a place like that. Also, make sure to hit the spa. Bah, now I'm jealous. Booking that trip sounds like the best motivation ever =D! I'm trying to get back into shape too, and it sounds like you've got all the motivation you need, and your love for muscles can't hurt =D! I'm definitely going to contact the hotel before the trip to see what I can do. Thanks everyone for the tips and help!! Good for you! I spent an afternoon in Porta Plata when our cruise ship docked there so we could snorkel. The only thing we did was get off the ship, take a bus to the beach where we snorkeled and there were many children trying to help us carry our gear. In other words, they were begging for money. The snorkeling was great. This is super helpful for me to read, the A-man and I haven't figured out a honeymoon destination yet. You know, once you get into working out, you wonder why it took you so long to get started in the first place!